Virgil I. Grissom High School, more commonly referred to as Grissom High School, is a public high school in Huntsville, Alabama, United States with approximately 2000 students in grades 9-12 from Southeast Huntsville. The school was named a 2007 Blue Ribbon School by the U.S. Department of Education. In the Newsweek ranking of schools throughout the nation for 2015, Grissom High School was ranked second best in the state and 390th nationally. Grissom was the only high school in Huntsville to make the 2015 list. 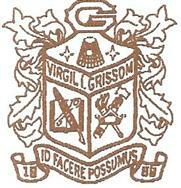 Grissom High School was founded in 1969 and is named for astronaut Virgil I. "Gus" Grissom, killed in the Apollo 1 fire at Cape Kennedy, Florida on January 27, 1967. Huntsville is home to NASA's Marshall Space Flight Center and has ties to the space program. At the same time, the Huntsville City Schools named Roger B. Chaffee Elementary and Ed White Middle School for Grissom's fallen Apollo 1 crewmates. In August 2012, the Huntsville City Schools announced plans to tear down the original two-story main high school building and replace it with a three-story structure at an estimated cost of $58 million. The rebuild would see ninth graders held at their feeder middle schools until construction is completed in 2016. Tom Drake served as Grissom's principal from 2000 through August 2013. The school board named June Kalange, then a vice-principal and former science teacher at Grissom, as his replacement in early August 2013. In 2015, Rebecca Balentine, the then principal of Jones Valley Elementary School, was announced as the new principal of the school. She was principal until the end of the 2017-2018 school year. The current principal is Grissom High alumni, Jeanne Greer. In 2007, Newsweek magazine ranked Grissom among the top 5% of all high schools in the United States. The school was ranked 531 among the top 1200 high schools in the nation based on the number of Advanced Placement, Cambridge tests, and/or International Baccalaureate tests taken by all students at a school and then dividing by the number of graduating seniors. In the Newsweek ranking of schools throughout the nation for 2015, Grissom High School was ranked second best in the state and 390th nationally. Grissom was the only high school in Huntsville to make the 2015 list. Grissom produced 28 National Merit Semifinalists for 2007, the highest number in the state. Grissom's math teams and academic team have also earned national recognition. Grissom's 2007 Science Olympiad state team placed 2nd at the state competition at Samford University. They participated in the National Science Olympiad competition in Kansas in May 2007, and in 2008 participated in the National competition in Augusta, Georgia. In 2008, Grissom's Debate and Speech Team qualified for, and competed in the NFL National Tournament in Las Vegas, Nevada. Students from Grissom can participate in a dual enrollment program and take classes at Calhoun Community College, the University of Alabama in Huntsville, and the University of Alabama in Tuscaloosa through correspondence. As of 2007, Grissom has football, boys' and girls' basketball, volleyball, baseball, cross country, softball, track, golf, swim/dive, boys' and girls' soccer, boys' and girls' tennis, wrestling, and cheerleading teams, a dance program, a choral program, a theatre program, as well as marching, symphonic, and jazz bands. Other notable extracurricular activities include an academic team and an extremely competitive math team, that in addition to competing in contests, runs numerous mathematics programs, camps, and competitions. Rocket City Math League is an international mathematics competition run by Grissom math team students. A wide variety of extracurricular clubs are also present at Grissom. Grissom's academic team has won 9 Alabama UAB/Alabama Scholastic Competition Association (ASCA) state championships (1982 (4A), 1987 (5A-6A), 1991, 1998, 2000, 2001, 2003, 2004, & 2013 (The state's inaugural Junior Varsity Championship.)) - the most of any Alabama high school. Grissom's bimonthly newspaper is The Imprint, which is recognized by the Alabama Scholastic Press Association. The annual literary magazine is called Seed, and the annual school yearbook is named Invictus. ^ "Virgil Grissom High School". National Center for Education Statistics. Retrieved December 7, 2018. ^ "Institution Summary, Virgil I. Grissom High School". AdvancED. ^ "Selected 2007 Schools". No Child Left Behind-Blue Ribbon Schools Program. U.S. Department of Education. August 15, 2008. ^ a b "America's Top High Schools". Newsweek. August 19, 2015. ^ Whitmire, Olivia (August 24, 2018). "Sidewalk on Old Grissom High campus holds 40 year old memories". WHNT 19 News. Retrieved February 27, 2019. ^ Jaques, Bob (June 6, 2002). "First spacewalk by American astronaut 37 years ago" (PDF). Marshall Star. NASA Marshall Space Flight Center. p. 5. ^ Banaszak, Nick (August 16, 2012). "Major Makeover Planned For Grissom High School". WHNT-TV. Retrieved August 17, 2012. ^ Bonvillian, Crystal (August 9, 2013). "Huntsville board names June Kalange as new principal of Grissom High School". The Huntsville Times. Retrieved August 11, 2013. ^ DeButts, Jimmy (May 21, 2007). "Irondale school among nation's best". Birmingham Business Journal. ^ "Grissom puts 28 in Merit semifinals". Huntsville Times. ^ Ballard, Kimberly (June 21, 2018). "Nostalgic Goodbye to Old Grissom High & Exciting Hello to New South Huntsville Library". Huntsville Business Journal. U.S. Rep. Mo Brooks, who played baseball for Grissom, graduating in 1972. ^ Oswalt, Terry D. (October 29, 2012). "Mike Brown". 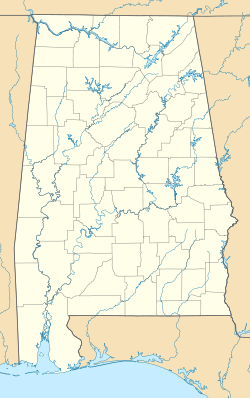 The Encyclopedia Of Alabama. ^ "Spike McRoy". Golf Info Guide. ^ Haskins, Shelly (August 28, 2016). "How an Alabama author's debut novel landed her on 'The Daily Show'". The Birmingham News. She graduated from Grissom High School in 2007, then from Stanford and the Iowa Writer's Workshop. ^ Easterling, Mike (December 12, 2010). "Grissom's Marvin Stone made presence felt in the '90s". The Huntsville Times. ^ McCarter, Mark (April 9, 2010). "Huntsville-Madison County Athletic Hall of Fame inductees: Tim Stowers a national champion coach". The Birmingham News. Stowers was an all-state player at Grissom High in 1976. ^ "Grissom Football Team History". Alabama High School Football Historical Society. ^ Gattis, Paul (Jan 23, 2017). "Huntsville native appointed to White House analyst position". Peter hails from Alabama's Fifth Congressional District and is a fellow graduate of Grissom High School. ^ "U.S. Air Force General Hyten nominated to be next vice chairman of Joint Chiefs of Staff". Reuters. April 9, 2019. ^ "Authors: Kay Cornelius". Barbour Publishing. Archived from the original on June 18, 2006. ^ "Children's Author/Illustrator Kay Cornelius". Answers.com. ^ "Counselor's profile of Grissom High School". Grissom High official website. ^ "UAH Dual Credit Program". University of Alabama in Huntsville. ^ "Grissom High School sports directory". Grissom High official website. ^ "Alabama Scholastic Competition Association". HS Winners Archive. Alabama Scholastic Competition Association. Bryan, Shevaun. "Groundbreaking for Grissom High’s new site." WHNT. October 2, 2014. Riopka, Melissa and Matt Kroschel. "UPDATE: Big plans for Grissom High School once new campus is complete." WHNT. October 2, 2014. This page was last edited on 10 April 2019, at 01:53 (UTC).